In the past, Blogger (blogspot.com) only provided single level commenting feature, which means the comments posted will be showing one after another , and there's no option to reply to a specific comment. Now you can. Then how to set up the 2-level commenting "reply" feature in Blogger (blogspot.com) ? Step 1: Set you blog feed to "full". From your Blogger dashboard, go to Settings->Other, then in Site Feed section, change Allow Blog Feed to "Full". As in following screenshot. Make sure to click on the orange Save Settings button at the top right corner of the page to save the changes. Step 2: Set Comments Location to "Embedded"
From your Blogger dashboard, go to Settings->Posts and Comments, then in Comments section, set Comment Location to "Embedded", as in following screenshot. 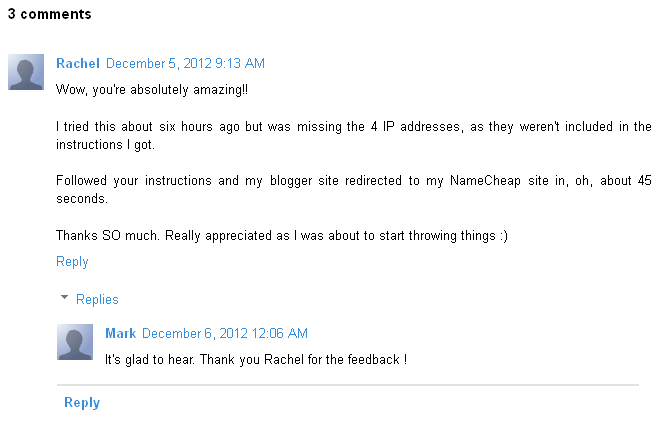 You can go back to you blog posts now, take a look at any comment, do you see the "reply" button under the comment?